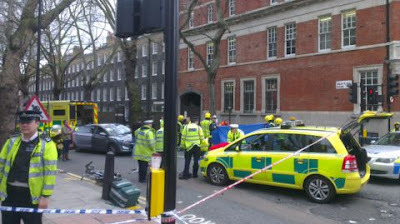 Cyclists in the City: Another week, another person crushed on a bike by a tipper truck in central London. This is becoming ridiculous. We need meaningful and proper intervention - on our roads and in the construction industry. And we need it now. 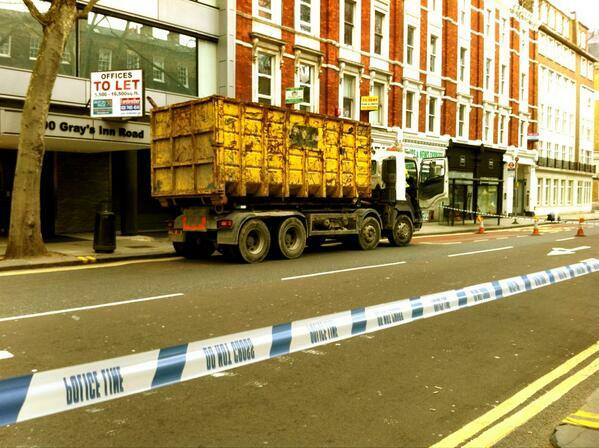 Another week, another person crushed on a bike by a tipper truck in central London. This is becoming ridiculous. We need meaningful and proper intervention - on our roads and in the construction industry. And we need it now. 2009. A green tipper truck. Just near Oval tube station at the junction of Kennington Park Road and Harleyford Road. Plus Catriona Patel, cycling to work. "'I've lost half of my life' - a man speaking today about the death of his wife. Katrina [sic] Patel was crushed by a lorry last year, cycling through the morning rush-hour by Oval tube station. The driver, Denis Putz, was over the legal drink-drive limit. He was on his mobile phone. And he'd been caught 'driving while disqualified' 20 times before. He was jailed for 7 years yesterday and 'banned from driving' for life." Read that carefully - he'd been caught driving while disqualified 20 times before. What sort of industry hires people who are so utterly incapable of doing the job safely and gets away with it? Last week, "Dr Katharine Giles, 35, a lecturer and research fellow at University College London, was crushed to death under a tipper truck in Victoria as horrified commuters looked on". This afternoon, a young man on a Boris bike airlifted to hospital with extremely serious injuries. Pictured left, guess what, a tipper truck involved in the collision. The BBC yesterday: "A sat-nav system which warns lorry drivers when they are approaching roads where they are most at risk of hitting a cyclist has been unveiled." The Manchester Gazette earlier this week: "Cyclists in Manchester are set to benefit from investment in safer roads...[with] 100 advanced stop lines and 50 trixi mirrors help prevent cyclist casualties". I don't hold out much hope for trixi mirrors or sat nav gizmos making a blind bit of difference. What I do trust, however, is the report by the Netherlands' road safety institute which says this: "Truck drivers do not make the best possible use of the different mirrors [and] cyclists insufficiently take account of the fact that trucks have a limited visual field. The ultimate solution for the blind spot problem is a structural separation of trucks and cyclists." Enough is enough. The solutions proposed and promoted by the UK media are half-baked, ill-thought through and not good enough. The Dutch are right. You need to keep tipper trucks and people on bikes apart from each other. The majority of people killed on bikes on London's roads are killed in collisions that involve tipper trucks. But you also need to sort out the lethal practices of the construction industry. Every week, it seems, another person is mauled or killed by a tipper truck. My view? The construction industry has a lot to answer for. As ibikelondon blog puts it: "A combination of unscrupulous payment practices whereby some drivers are paid per load, a distinctly criminal element that runs through the haulage industry, and the fact that most drivers (no matter how careful) can't actually see the vulnerable road users around them, combine to ensure that HGVs are the most dangerous vehicles on the roads, and account for a shocking level of deaths." I'd clarify that comment a bit and say it's not just any old HGV drivers. It is largely (but not exclusively) tipper truck drivers that are the menaces on our streets, driving waste for the construction industry. The Mayor needs to start showing he means business. These trucks are not allowed to reverse on site without a banksman/woman. So why on earth is the construction industry only responsible for trucks on-site, not on our streets? Boris Johnson commented last week that he might consider some sort of lorry ban at rush hour or for lorries without the right safety kit (although I'm not entirely sure he has the powers to do this yet). But he also needs to speed up the development of cycle networks that are safe for people to use and where, as the Dutch road safety institute says, they are kept well, well away from tipper trucks and other HGVs. He also needs to call up councils like Westminster which is proposing to make its streets even narrower, forcing HGVs and people on bikes into the same narrow space. And in the meantime, I'd recommend you read Mark Ames's sage words of advice: " Always remember; if the truck is ahead, stay back. If the truck is behind, get ahead." But just using this common sense isn't enough. I avoided being run over by a tipper truck last summer by bailing out on to the pavement. The driver decided to overtake me in a pinchpoint. The only two options were a) deliberately fall off my bike b) have the driver run me over. This, by the way, is a pinchpoint on Cycle Super Highway 8 that now has a massive 'look out for cyclists!' sign in front of it. The engineers know it's not safe. It isn't safe. They need to sort it out. Getting ahead or staying back isn't enough to keep you safe on a bike. We need meaningful and proper intervention - on our roads and in the construction industry. And we need it now. Time for another Tour du Danger? I rather liked the Bikes Alive protests. Regular, causing a scene and making a big point. It's a shame they fizzled out. I don't think we'll get very far being too nice! I wasn't keen on the name though – it really needs to be about a better London for everybody. We need disabled, elderly, pedestrian groups and parents to be part of the vanguard. As Jltensha Oni says, this isn't just a London problem. I live near a small town in Suffolk, which has a gently curving stretch of road. Now the place has a Tesco, Smiths and other multiples, it is infested with delivery lorries (big ones) as well as the buses being driven like Jehu. Avoiding being sideswiped into the banked roadside by the back end of one of these things overtaking is a daily event. It seems to me that there is no education about, or awareness of the dangers to cyclists. When you can kill someone, blame the victim for his/her own death, and get off more or less scot-free, there isn't much incentive to consider the consequences of your actions. Yep. And not just London. Surrey. Today. Entering a 2 lane roundabout to go straight on, in primary. A truck from behind revs hard to get their cab in front in the right turn lane and then cuts right across me to get into the straight on lane. Only by veering sharply left could I avoid being totalled by their trailer. Sort of a Reverse Magnatom. Construction trucks need to be forced to carry a banksman at all times. pay per load needs to be outlawed for drivers (urban delivery couriers also) as it just makes people rush and cut corners and safety. Fine for sealing envelopes, but not driving 20 ton trucks around city and town streets. I also cannot help but wonder if left hand drive for trucks is not a bad idea? On m-ways & similar, they are high enough to see, and LHD would give the driver much better visibility of cyclists and pedestrians in urban areas. Road sweepers generally are already. What we need is the HSE's remit to cover not just what happens on building sites, but also all road movements of vehicles contracted by the developers. The HSE would not allow the sort of butchery by tipper drivers on the roads, if it happened inside the building sites. For sure, the Health & Safety at Work etc Act 1974 makes employers responsible (as far as is reasonable practicable) for not just their employees, but also other affected by their activities. I don't think anything needs changing from this point of view other than making the HSE investigate (reported) near misses and certainly injuries. Even if the police does not have evidence on the driver, the HSE has the power to go through the employer's safety management procedures and have them that way. In addition, larger construction jobs (30 days or more / 500 person days of people working on the job or more), projects must be notified to the HSE and a "CDM-Coordinator" appointed. The CDM-C has a role in coordinating safety, the scheme designer has to think about how the project is to be built and the contractor has to look at the risks involved. It would be interesting to see what those employing these drivers have in place, extended all the way back to the overall client. No matter how well driven and how well designed, having to cycle on the streets along with lorries will put the majority of people off cycling. We need separation and we need it yesterday. It's time for the LCC to show some conviction and take to the streets in protest. I wonder if the DoT would do well to start an advertising campaign in magazines that simply tells riders "STAY AWAY FROM LORRIES"
On our rides when we take new people out we always get them to hold back from passing a lorry in traffic until it is absolutely clear to do so and we know we are going to get a good headstart from it. It may seem like blame shifting to some but sometimes youv've got to be pragmatic to get the message out. I wonder why they are playing with riders' safety? 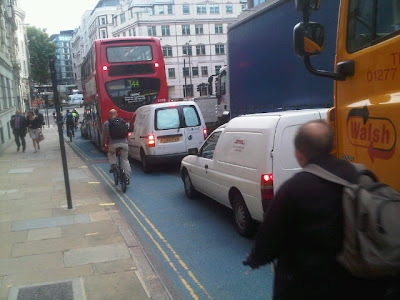 I love cycling and I can understand the fear of coming in front of lorries. It is not safe anymore. No, not at all on London Streets. Somebody should take a step against this injustice. Many accidents are caused by the truck drivers who drive their trucks too fast and carelessly. There should be strict law against those people too. Our safety is very important and it's everybody concern. We always need Houston 18 wheeler accident lawyer can help for any legal aspects. Be worry free when dealing with your case. You are not alone. There is always someone who can help on every situation. The light weight, tangibility, elecations, ice technology and lightest hydraulic disc brake system are the main features of modern brakes . Lots of accidents are caused by the truck drivers who drive very rough and carelessly.